If you are looking for one more awesome cookie recipe to add to the cookie plate, look no further. 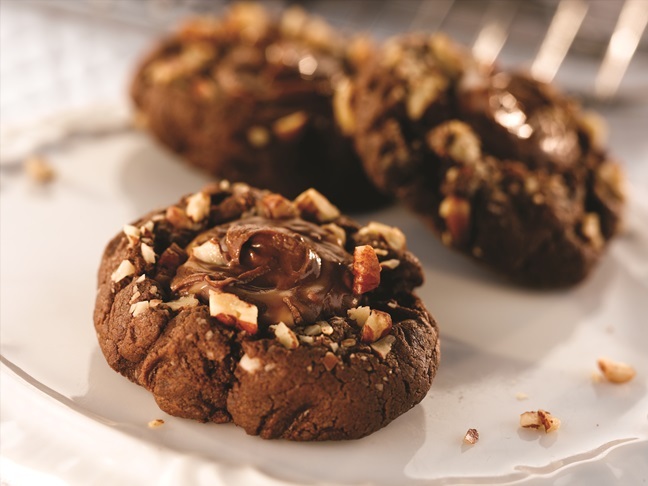 These chewy Turtle Fudge Chocolate Chip Cookies are rich and gooey and will please the whole party. Make it easy on yourself and make the batter ahead of time. Bake them fresh when you are ready to eat! Check out the recipe, courtesy of Martha White, below. Step 1: Heat oven to 350º F. Coat large baking sheet with no-stick cooking spray. Microwave chocolate and butter in uncovered large microwave-safe bowl on HIGH for 2 minutes or until butter is melted. Stir until chocolate is completely melted and smooth. Stir in sweetened condensed milk. Stir in muffin mix until completely blended. Step 2: Roll tablespoonfuls of dough into balls. Dip bottoms into pecans. Place on baking sheet with nut side up, 2 inches apart. Step 3: Bake 7 to 8 minutes or just until cookies look slightly crackled and centers are still soft. Immediately press a caramel candy into center of each cookie. Remove to wire rack. Swirl caramel candy gently with knife while candy is warm, if desired. Cool completely.